After signing on the lease at my new place my future roomie suggested we check out a Mexican place around the corner from our apartment. I'm always into Mexican food and not only because it is normally a simple meal to eat gluten free. We arrived and soon order margaritas (me a pomegranate, Adam a regular) and some chips and guacamole. The chips at Barrio Star are sprinkled with chili flakes which add a nice flavor. The guacamole is freshly made and delicious. The margaritas are strong and tasty; I've been to Barrio Star a few times since moving in and usually get the Pomegranate. You can check out a dinner menu here. That PDF doesn't mark the gluten free items but in the restauran the menu is marked with "gf" symbols. 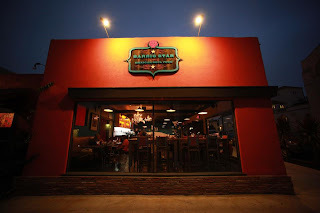 Barrio Star is very gluten free friendly and has a lot of options for the discerning gluten free eater.